How bonny she looks in her new specs! Shida recently returned to Mayega from another trip to the Kilimanjaro Christian Medical Centre. 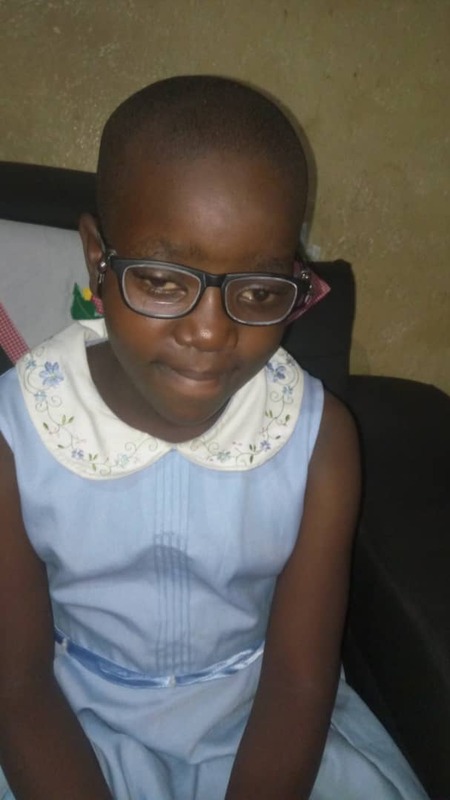 Doctors were sufficiently happy with the way her right eye has healed, following her fifth surgery, to arrange for glasses to be made in Nairobi. Shida is now getting used to them. She remains under the care of the eye hospital and will return for a check up in April. Her range of vision is limited but she is happy that she has some sight. Sadly, it looks unlikely that sight can be restored to her left eye. Shida has been supported by many people, who have made her medical treatment possible. Special mention must be made of Leya Lusana, the matron of the Children’s Centre. Matron and Leya have travelled together for over 5,000 miles! An amazing commitment from Leya to help a very brave little girl.